Telegraph equations describing the particle densities in Brownian movement on a lattice site have been derived and it has been shown that the complementary classical Dirac equation appears naturally as the consequence of correlations in particle trajectories in Brownian movement. It has also been demonstrated that Heisenberg uncertainty relation between energy and time is the necessary and sufficient condition to transform this classical equation into usual Dirac’s relativistic quantum equation. The relativistic propagator for a free particle in space can be obtained [1-5] from the considerations of the statistics of random walks in space and time without restoring to formal analytic continuation. It has been shown  that the wave functions and propagators that occur in classical equations are themselves observables on the lattice in contrast to quantum mechanics where wave functions are rather mysterious objects which only facilitate calculations and which are not themselves observables. It has also been shown  that the free particle classical Schrödinger’s equation in space occurs naturally in the description of correlations in random walks on the lattice where the wave-function solutions describe the features of ensembles of random walks. In recent attempt a stochastic model of the telegraph equation due to Kac  and Gaveau et al. has been extended  to obtain Dirac Equation for a particle in electromagnetic field using Brownian motion in time as well as space. Recently, the relativistic diffusion processes have been discussed in random walk models  and the quantization of Brownian motion have been worked out . In our earlier papers [13-15] the diffusion equation and classical Schrödinger’s equation for free particle and also for a particle under a force field have been derived as complementary equations from the Brownian motion and it has been shown that the continuum limit which transforms this classical Schrödinger’s equation into the usual Schrödinger’s quantum equation without using any formal analytic continuation and the wave-particle duality, is simply Heisenberg’s uncertainty relation between position and momentum of the Brownian particle. Extending this work in the present paper by putting a finite speed cutoff into the diffusion process we have obtained telegraphic equations to describe particle densities in Brownian movement on a lattice site and showed that the complementary classical Dirac equation appears naturally as the consequence of correlations in particle trajectories in Brownian movement. Here the constituents of wave-function describe the features of ensembles of random walks on lattice and hence the observables are easily interpreted. We have also derived the condition which transforms this classical Dirac equation for Brownian movement into usual Dirac’s relativistic quantum equation and it has been demonstrated that this condition is basically Heisenberg’s uncertainty relation for energy and time. which is the master set of equations for the ensemble of random walks giving the distribution of particles in the four states. which is proportional to the probability that a particle arrives at in any state. plays the role of the wave length. where Equations (2.16) give a particular form of Telegraph equations. which give another form of Telegraph equations. The ensemble of particles, described by master Equations (2.2), change its state with each step and it takes eight time steps for the ensemble to return to its initial statistical state in the sense that the expected number of direction changes per particle is four . Thus the Equation (3.2) in the continuum limit is iterated for eight time steps i.e. which is Heisenberg’s uncertainty relation for energy and time. Equations (2.16) and (2.17), obtained from the Brownian movement represented by master Equations (2.2), give two different forms of Telegraph equation. The classical Dirac Equation (3.16) in one spatial dimension and its generalization into the form given by Equation (3.19) appear naturally as the consequence of master Equations (2.2) and (3.10) of Brownian movement, where the constituents of y, given by Equation (3.15a), have the meaning on the lattice and denote the limits of ensemble averages of excess parities. These functions are not just the calculational tools and the function y describes the features of ensembles of random walks on lattice and hence the observables are easily interpreted in contrast to the usual quantum mechanics. 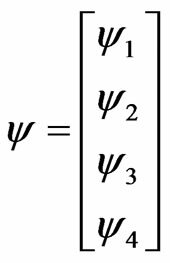 The conditions (3.22) which transforms the classical Dirac equation for Brownian movement into usual Dirac’s relativistic quantum equation, is basically Heisenberg’s uncertainly relation (3.23) for energy and time. The usual formal analytic continuation which is necessary to relate the classical and quantum equation is completely absent here and hence the interpretation of quantum mechanics here is direct one without the problems of measurements usually associated with quantum mechanics. Here the derivation of Dirac equation is a sensible classical scheme to produce many particle simulations of quantum mechanics where quantum equation exists as a description of classical theory (Brownian movement). In our earlier papers [13-15] it has been shown that for transforming the classical Schrödinger’s equations, obtained as the consequence of Brownian movement, into usual Schrödinger’s quantum equation the necessary condition is Heisenberg’s uncertainty relation between position and momentum of the Brownian particle. In the light of this result and the forgoing discussion it may be concluded that the classical equations for ensemble averages of excess parity in Brownian movement can be transformed into usual Schrödinger’s equation by imposing Heisenberg’s uncertainty relation between position and momentum of Brownian particle and the similar classical equations can be transformed into usual Dirac’s equation by imposing the uncertainty relation between energy and time associated with Brownian particle without using a formal analytic continuation and wave-particle quality. These results support the recent work  on the role of generalized uncertainty principle in the development of quantum mechanics from classical context. These results partially support the earlier work [1-5] showing that the quantum mechanical equations are the derived properties of the binomial distribution and no formal analytic continuation is required to produce them. Some results of this paper shall be helpful in framing the foundation of space-time path formalism  for relativistic quantum mechanics. We shall undertake the study of this problem in our forthcoming paper. D. G. C. McKeon and G. N. Ord, “Time Reversal in Stochastic Processes and the Dirac Equation,” Physical Review Letters, Vol. 69, No. 1, 1992, pp. 3-4. M. Kac and Mt. Rocky, “A Stochastic Model Related to the Telegrapher’s Equation,” Rocky Mountain Journal of Mathematics, Vol. 4, No. 3, 1974, pp. 494-510. M. Kac, B. Gaveau, T. Jacobson and L. Schulman, “Relativistic Extension of the Analogy between Quantum Mechanics and Brownian Motion,” Physical Review Letters, 53, No. 5, 1984, pp. 419-422. D. G. C. McKeon and G. N. Ord, “Time Reversal and a Stochastic Model of the Dirac Equation in an Electromagnetic Field,” Canadian Journal of Physics, Vol. 82, No. 1, 2004, pp. 19-27. B. S. Rajput, “Telegraph Equations and Complementary Dirac Equation from Classical Approach,” Acta Ciencia Indica, Vol. 36, No. 1, 2010, pp. 81-88. Ed. Seidewitz, “Foundations of a Spacetime Path Formalism for Relativistic Quantum Mechanics,” Journal of Mathematical Physics, Vol. 47, No. 11, 2006, Article ID: 112302. *Permanent address: I-11, Gamma-II, Greater Noida (UP) India.